We offer the largest selection of wines and spirits on the Island. The Wine Cellar was established over 27 years ago and have just moved to our new premises, situated at The Milestone, Peel Road. We are all passionate about wine and we have, between us, over 130 years experience in the wine trade. Every wine on our shelves has been tasted by the team and therefore, we can confidently recommend a wine to suit your taste and pocket. 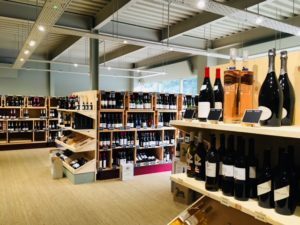 With wines from £5 up to over £100, there is something for every occasion, be it an easy drinking wine after hard day at work, or that extra special gift. We stock an extensive range of Malt Whisky, Gin, Vodka, Rum, Cognac, Armagnac, Liqueurs and Spirits as well as bottled beers and lagers, including alcohol free and gluten free. We keep various bottled soft drinks along with the more regular cans, and are one of few Island stockists of cigars.